I can’t remember the last time that I had such a busy week both in my day job and in my blogging world. 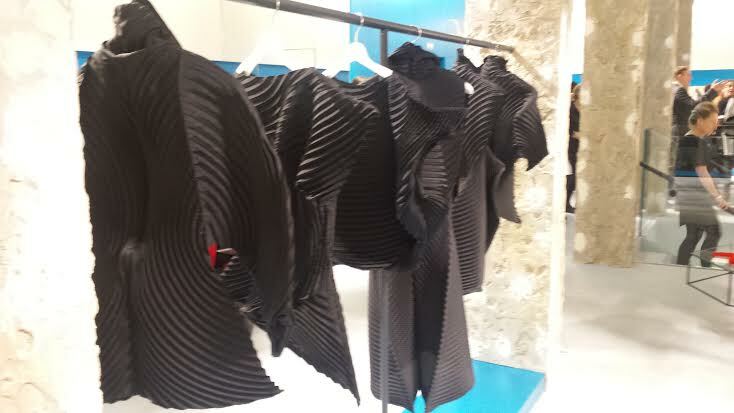 So when I had to make a quick dash across town to Issey Miyake I was really looking forward to a bit of glamour and relaxation. I’d planned to wear an outfit that went from court room to office to fashion show room and packed my make-up bag with my most glamourous products to try and impress. But when it came to the time to refresh my make-up for the evening ahead I realised that I’d left it at home! How shameful! Fortunately the lovely people from KGA weren’t at all judgemental and help to calm me with a glass of champagne! So why was I there? 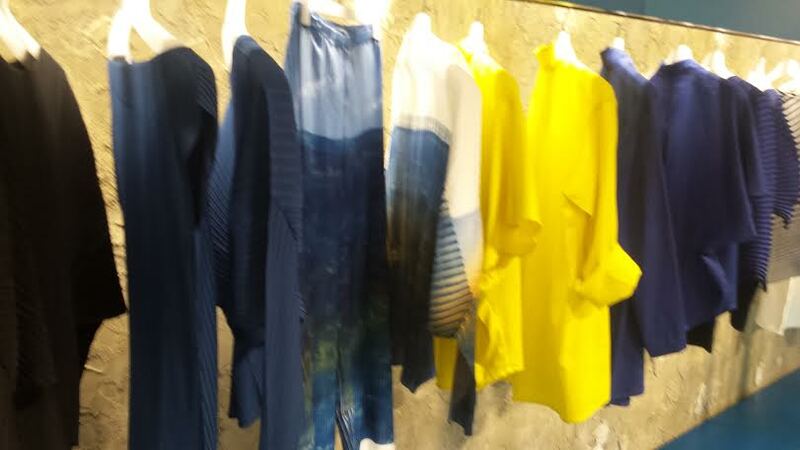 To see the latest fragrance launch for the fabulous Issey Miyake – L’Eau D’Issey City Blossom! 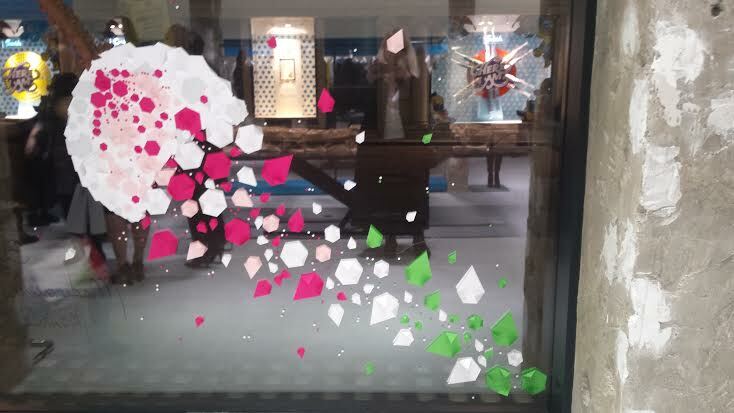 The surroundings for the launch were fabulous, not only was it in the uber chic Issey Miyake store in Brook Street but we were also treated to a live performance by Mademoiselle Maurice – a visual street artist. That’s some of her work on the window in the photo below. I’m no fashion guru as I’ve never had the figure or the bank balance to wear anything out of the ordinary but the pieces on display were stunning and the whole fashion and fragrance mix fuelled the buzz around the launch. 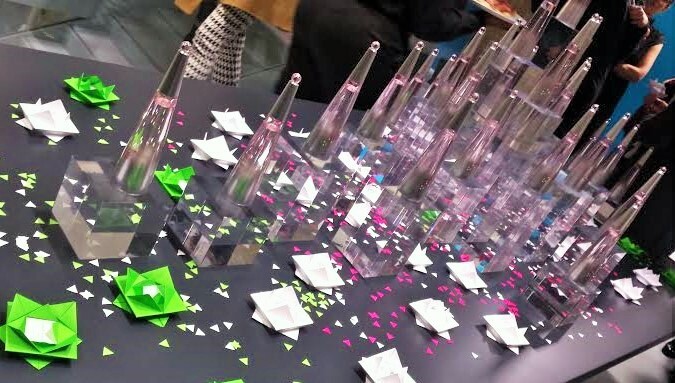 Almost everyone can recognise the iconic shape of the Issey Miyake fragrance bottles. Each is a tall conical delight with each new version being just a slight variation on the original. Then, having finished my champagne and taken a few photos I got to try the L’Eau D’Issey City Blossom fragrance for myself. “Inspired by the poetic and colored works of Mademoiselle Maurice, Issey Miyake captures the short-lived moment when a flower blossom appears in the city. In its colored trail, this flying bunch of flowers diffuses its first fragrance . A feminine floral woody fragrance which opens like a fresh bud with sparkling notes of pink pepper and bright lemon. Half-open, the flower unveils its heart, a bouquet of magnolia and freesia. The drydown unveils a flower in full bloom, while it liberates its generous sweetness around a subtle crystalline musk and woody notes! So what did I think – for me the strongest note was the pink pepper. It’s light and flower and certainly set me in the mood for saying good bye to winter and hello to spring! Not only that, the bottle looks perfect on my dressing table. This L’Eau D’Issey City Blossom is another winner for Issey Miyake! If you can’t wait to own it you can buy it here priced £51.00. I’d love to know what you think of it, so do leave your comments below.